Hyundai Motor said on Monday that the company signed an agreement with H2 Energy to set up a joint venture called Hyundai Hydrogen Mobility. H2 Energy is a European hydrogen energy company that provides hydrogen production and supply solutions and related consulting to its clients. H2 Energy is in charge of developing and carrying out businesses of The H2 Mobility Switzerland Association that was created in May, last year, with the goal of securing sustainable mobility and establishing hydrogen filling station network across the European country. 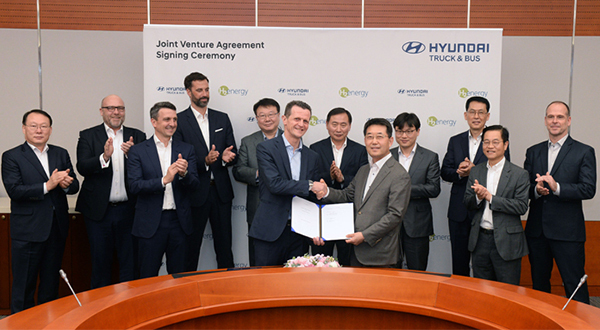 Under the latest deal, Hyundai Motor will supply a total 1,600 hydrogen-powered trucks to the joint venture Hyundai Hydrogen Mobility until 2025. Hyundai Hydrogen Mobility plans to review a diverse range of projects based on hydrogen energy such as providing Hyundai Motor’s hydrogen-powered trucks for commercial use in the market in the form of lease via H2 Mobility Switzerland Association. Hyundai Motor, meanwhile, also announced Monday that it will invest in a domestic startup – CODE24.ai – founded by former chief technology officer at Naver Corp., the country’s top search engine, to gain foothold in cutting-edge technology in future innovation and growth areas. Hyundai Motor did not disclose details on the investment size or stake ownership but the company said the investment isn’t big enough to incorporate the startup into its own affiliate. CODE42.ai is an up-and-coming startup set up by a former Naver official last month in Pangyo, Gyeonggi Province. The company is engaged in the development of urban mobility operating system, an overall mobility platform that involves all procedures of modern mobility service. With the latest investment, Hyundai Motor plans to actively cooperate with CODE42.ai to develop sophisticated smart mobility solutions. It will also join forces in the future vehicle sector such as of autonomous vehicles and connected cars as well as robotics, artificial intelligence, and precision map sectors.